I know many of you reading might have difficulty making decorating decisions, and because of that lack of decision making, you're facing design paralysis... changing nothing because you're not sure what to do. I get it, I do! I'm the same way with decisions more times than not. I've needed to purchase a new sofa for well over a year. I'm sure I've discussed it on the blog multiple times, I've had the money, I've just been dragging my feet. I finally discovered that I just haven't been able to totally make up my mind what I want, so I've committed to nothing. I haven't purchased a sofa in 15 YEARS... so it's a big decision, and I don't want to mess it up, right? 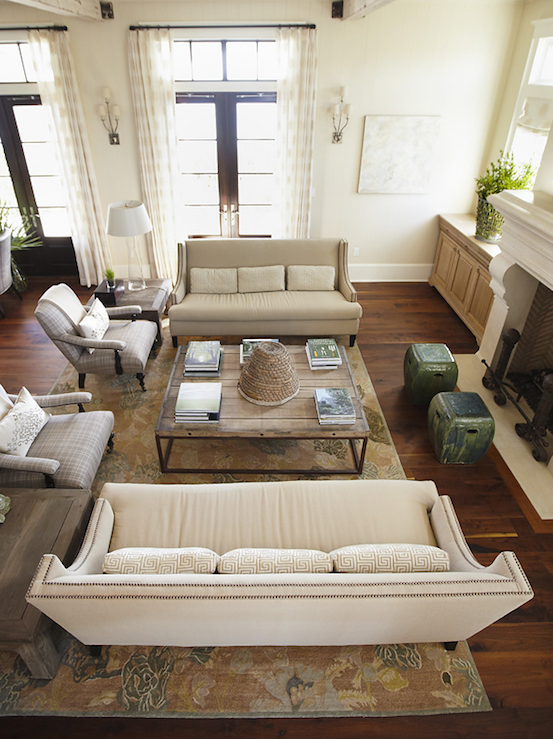 Here's my dilemma- The sensible side of me knows that going with a light colored neutral sofa would be a great choice. It goes with anything, and the look can be changed up just by switching out accessories. Pinks, Orange, Neutrals, check, check, check! 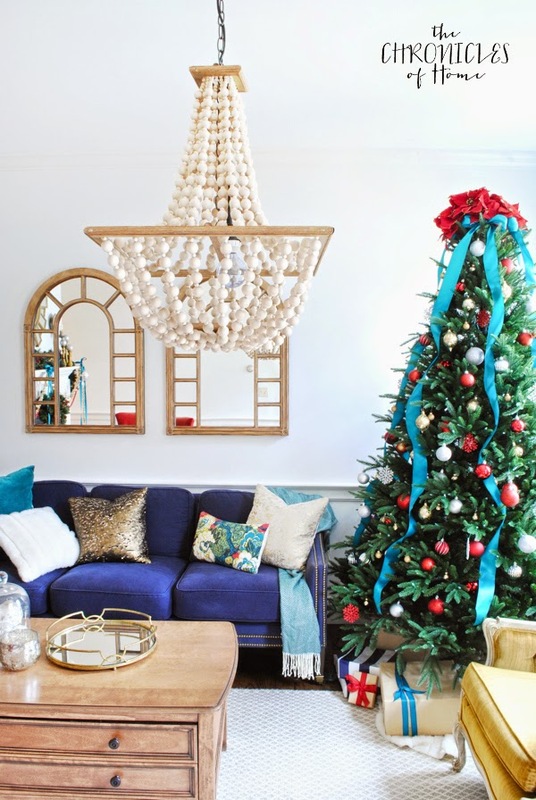 The Chronicles of Home- check out Jen's AMAZING DIY Beaded Chandelier! I honestly love both looks in all of the inspiration photos. So, you see my problem! *I don't want a slipcover, so I need to be able to treat/scrub stains if (more likely when) they occur. *I want my choice to still be completely versatile...you guys know I like to change things around often. 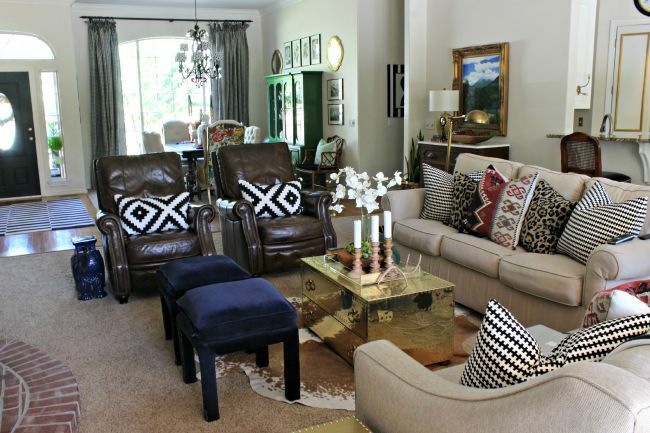 *This is really our main living area where we hang out, lounge, watch tv, eat, as well as entertain guests. *I don't want to be hyperventilating inside if someone is eating on the sofa...just waiting for a spill. *If I go with the bold color, I don't want to look back in a few years and think I totally just followed a fad by making that purchase (remember... 15 years!). *Looking around the room, everything that is "permanent" is pretty neutral now- paint, carpet, cabinetry, dining chairs in both areas, etc. *I'm working with our two dark brown leather recliners. They're staying. For now. *I'll be getting a matching sofa and loveseat. 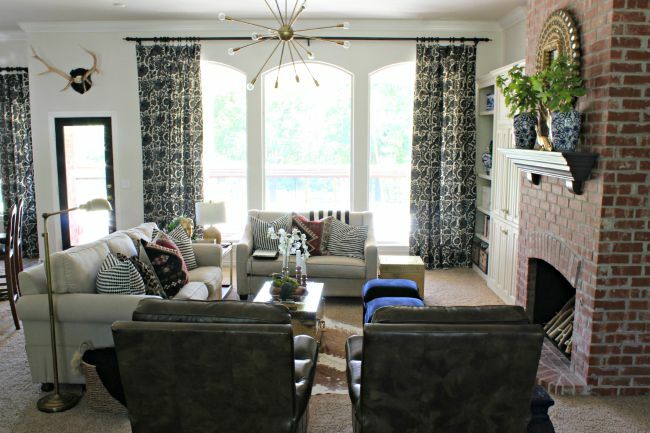 I want more space for lounging and the look of a sectional without the commitment of having to work with a sectional when I want to rearrange furniture. I've always loved the look of twin sofas, but our long skinny room won't accommodate that, so a loveseat will do. Here are a few hastily snapped (not perfect) photos just to give you an idea of the space. 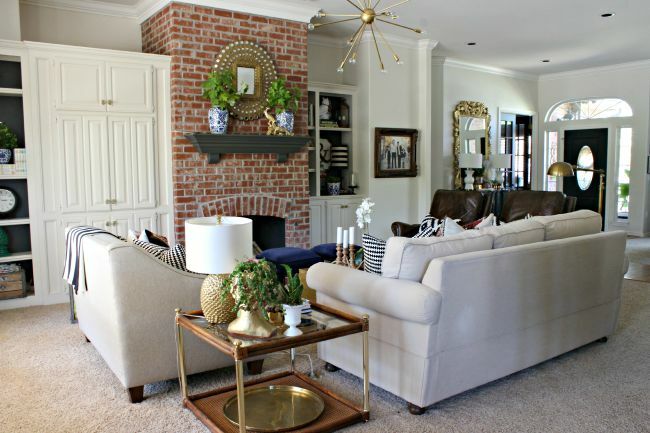 I rearranged the furniture this way a while back to get a feel of using the sofa/loveseat like a sectional, and I'm really liking it all squared up around the fireplace. The navy stools give a hint of what the room might feel like with that color added (they would obviously get moved to another spot). So, help! What am I not thinking of that I need to consider? And by the way, I've had a few people mention that they've not been able to comment here. I'm sorry, I don't know what the problem is and I hope it's not widespread. I'd still love your input, though, and would love for you to comment on my Facebook page if you can't here. Thanks!